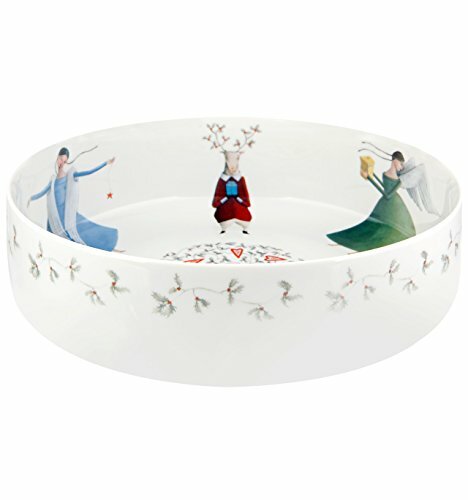 VISTA ALEGRE - ANGELS (Ref # 21115126) Porcelain Salad Bowl by Teresa Lima • Let Christmas grow wings with the Angels collection. * Material: Porcelain • Height: 86 mm * Length: 285 mm * Capacity: 3267 ml * Weight without Package: 1660 gr * Use restrictions: Microwave and dishwasher safe. • Founded in 1824, Vista Alegre the oldest porcelain workshops in Portugal and one of the most prestigious manufacturers in the whole of Europe. Innovative from its inception, the brand's trademark is striking contemporary pattern and colour. From Art Deco-inspired metallic finishes, to bright butterflies designed by Christian Lacroix, each piece demands to be the centre of attention.